47 Brand 100% cotton black v-neck women's tee with cap sleeves. Distressed imprint of 'BROWN' in cardinal with white outline above grey, cardinal, black, white, and gold Crest. Please select option for 47 Brand Black Crest V-Neck Women's Tee - $36.99. 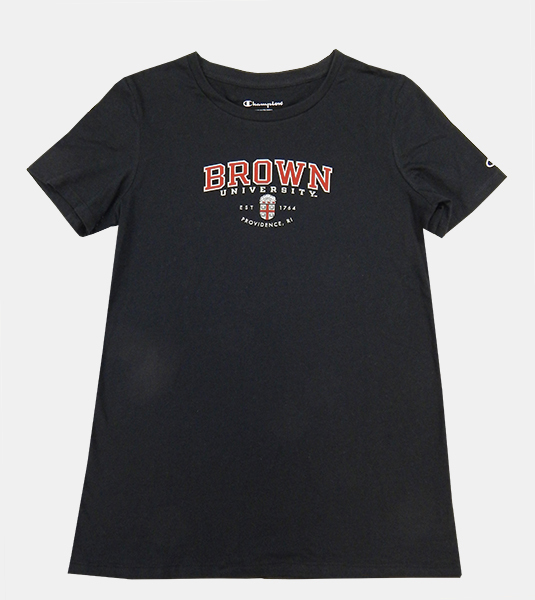 47 Brand 70% cotton, 30% polyester brown, long-sleeve, v-neck women's tee. 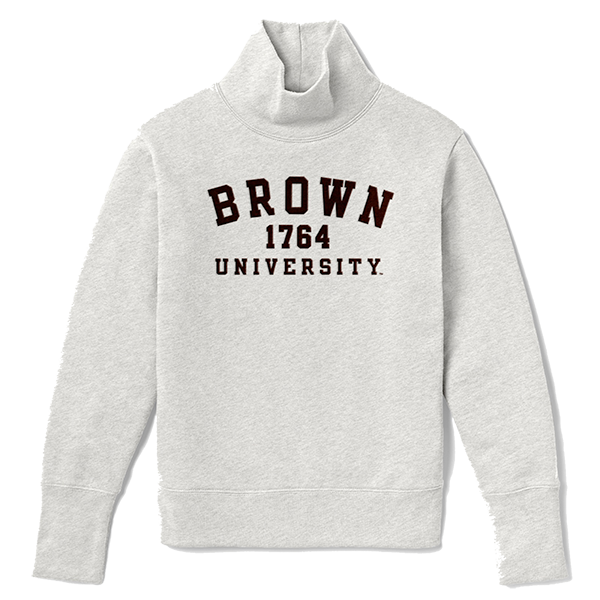 Large Crest imprinted in grey, cardinal, black, white, and gold above 'BROWN' in white. 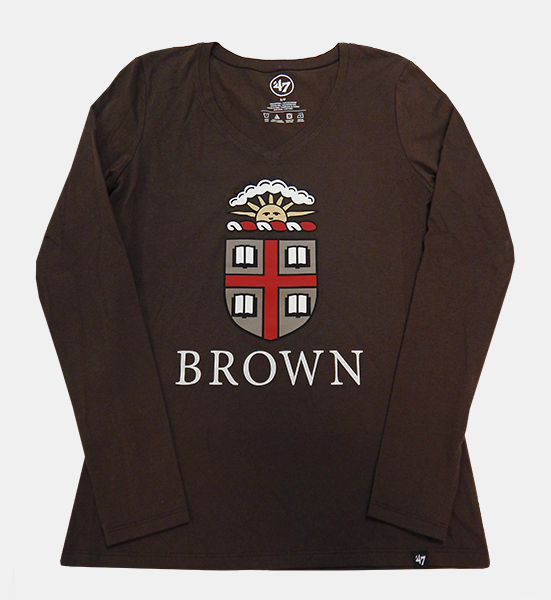 Please select option for 47 Brand Brown Crest V-Neck Long-Sleeve Women's Tee - $34.99. 47 Brand 100% cotton cardinal v-neck women's tee with cap sleeves. Distressed imprint of 'BROWN' in brown with white and black outlines above grey, black, white, and gold Crest. 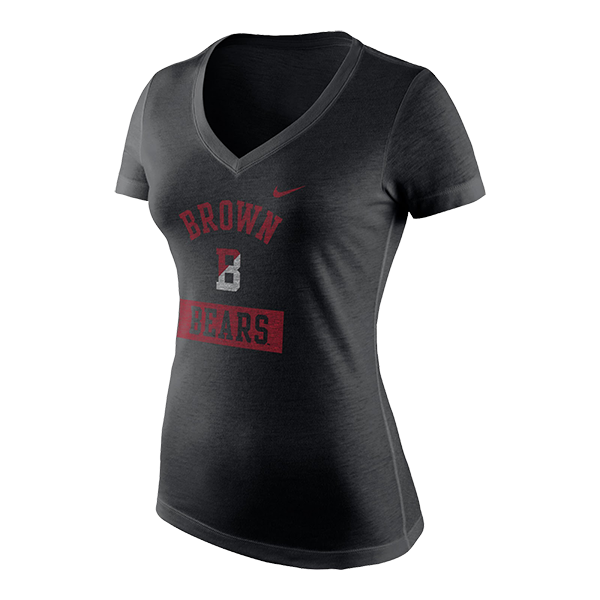 Please select option for 47 Brand Cardinal Crest V-Neck Women's Tee - $36.99. 47 Brand 70% cotton, 30% polyester, grey women's tee with cardinal 3/4 sleeves. 'BROWN' imprinted in cardinal above 'UNIVERSITY' in white above cardinal, black, white, and gold Crest. Please select option for 47 Brand Grey & Cardinal Univ. Women's Tee. 47 Brand 70% cotton, 30% polyester, grey scoop-neck women's tee with cap sleeves. 'BROWN' imprinted in white above '17' in cardinal next to cardinal, black, white, and gold Crest next to '64' in cardinal above 'UNIVERSITY' in cardinal. Please select option for 47 Brand Grey Crest Scoop-neck Women's Tee - $28.99. 47 Brand 70% cotton, 30% polyester, grey v-neck long-sleeve women's tee with a band of 3 distressed white stripes on upper sleeves. 'BROWN' imprinted in cardinal above cardinal, black, white, and gold Crest above 'UNIVERSITY' in cardinal. 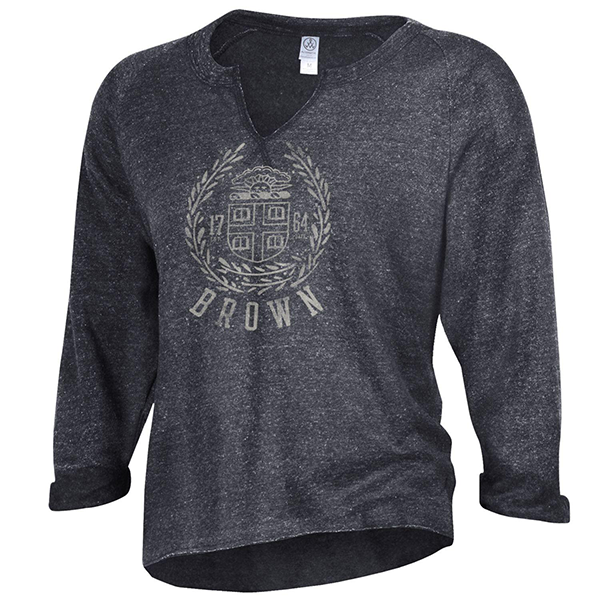 Please select option for 47 Brand Grey Crest V-Neck Long-Sleeve Women's Tee. 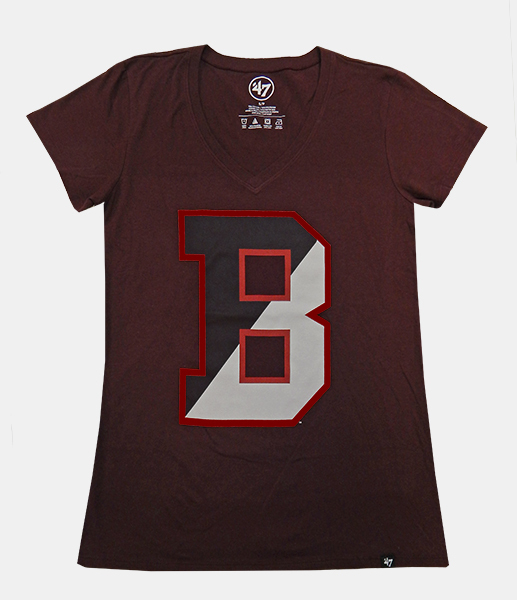 47 Brand 70% cotton, 30% polyester maroon v-neck women's tee with cap sleeves has large half-black, half-white 'B' with cardinal outline. 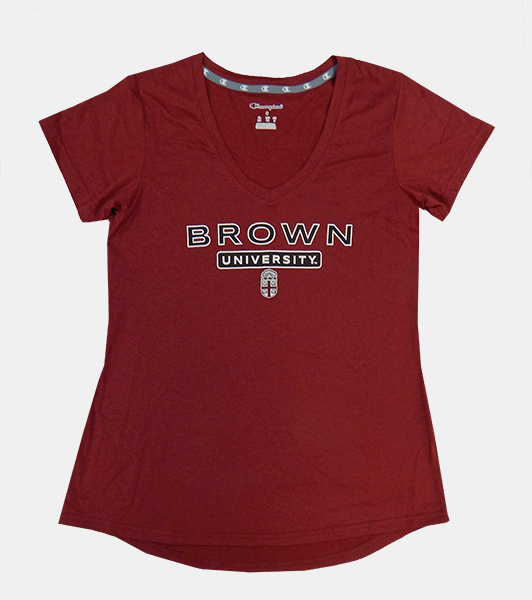 Please select option for 47 Brand Maroon B V-Neck Women's Tee - $28.99. 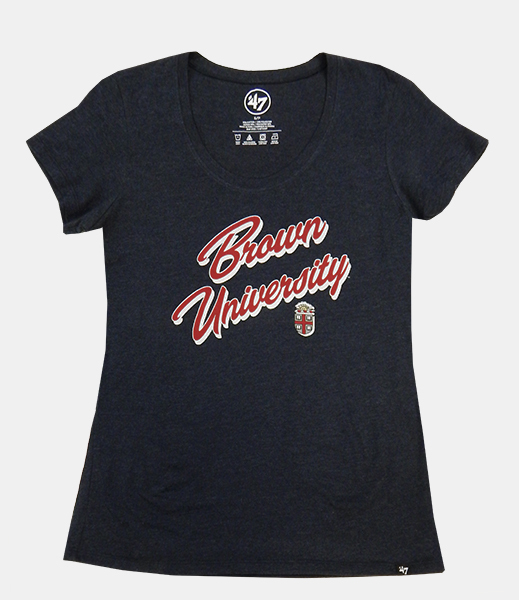 47 Brand 70% cotton, 30% polyester, navy scoop-neck women's tee with cap sleeves. 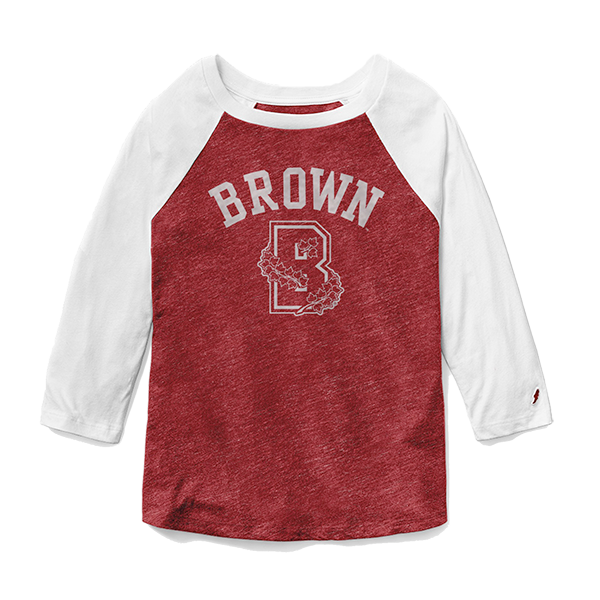 'Brown University' imprinted in cardinal script with white outline above small grey, cardinal, black, white, and gold Crest with white drop-shadow. Please select option for 47 Brand Navy Univ. 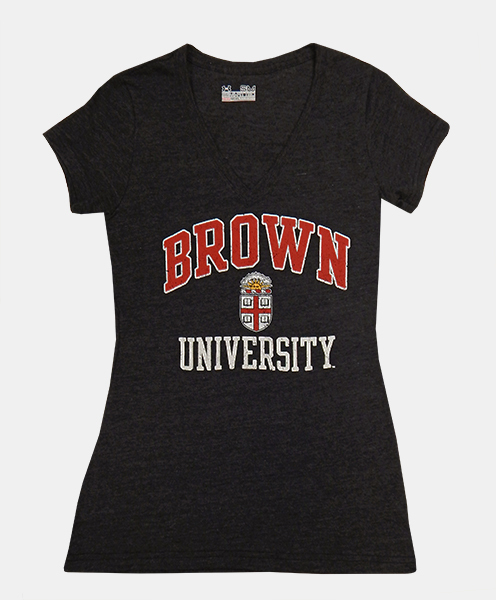 Scoop-Neck Women's Tee - $28.99. Alta Gracia 100% cotton, burgundy, ribbed v-neck women's tee with cap sleeves. Distressed imprint of 'BROWN' in black with black drop-shadow above grey, cardinal, black, white, and gold Crest. Alta Gracia garments are made in Villa Altagracia, Dominican Republic. The WRC, Worker Rights Consortium, has verified that this product was sewn at a factory where workers are paid a living wage and where their workplace rights are respected, including the right to unionize. 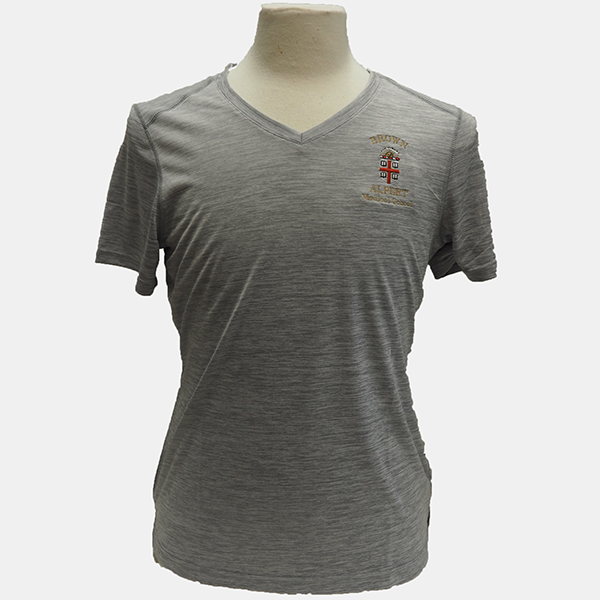 Please select option for Alta Gracia Burgundy Crest V-Neck Women's Tee - $24.00. Please select option for Alternative Apparel Eco Fleece Women's Champ Remix. 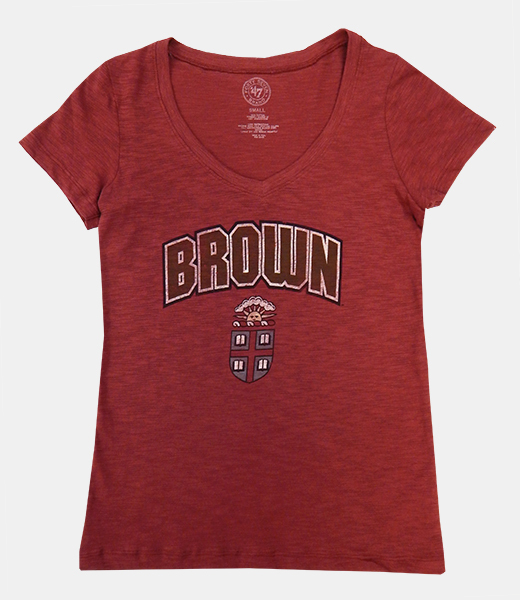 Champion 100% cotton black women's tee with 'BROWN' in cardinal with white outline above 'UNIVERSITY' in white above 'EST' next to cardinal and white Crest next to '1764' above 'PROVIDENCE, RI' in white. 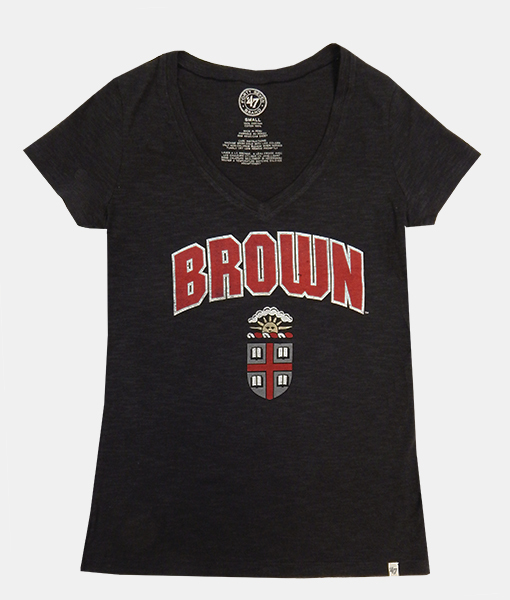 Please select option for Champion Black University Women's Tee - $20.99. 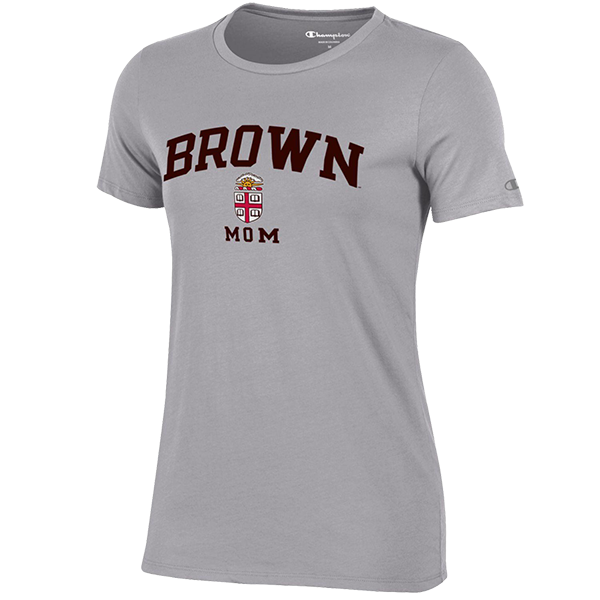 Please select option for Champion Brown Mom Short Sleeve Tee. 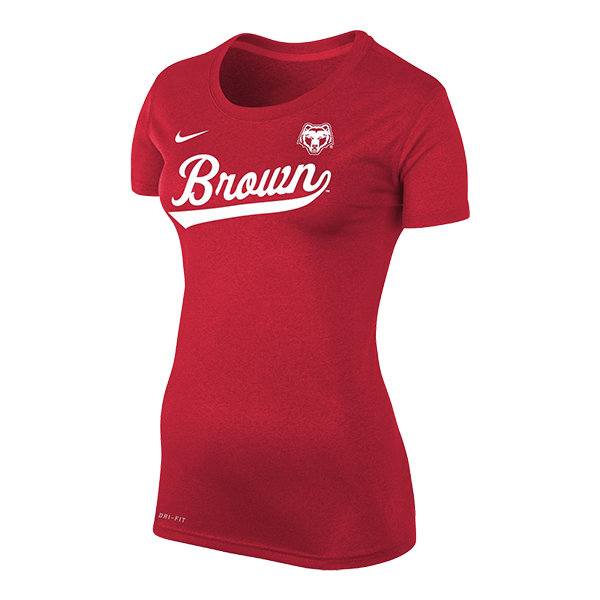 Champion 100% polyester, semi-fitted, cardinal v-neck women's tee with cap sleeves. 'BROWN' imprinted in black with white outline above 'UNIVERSITY' in white on black banner with white outline above cardinal, black, and white Crest. Please select option for Champion Cardinal Univ. 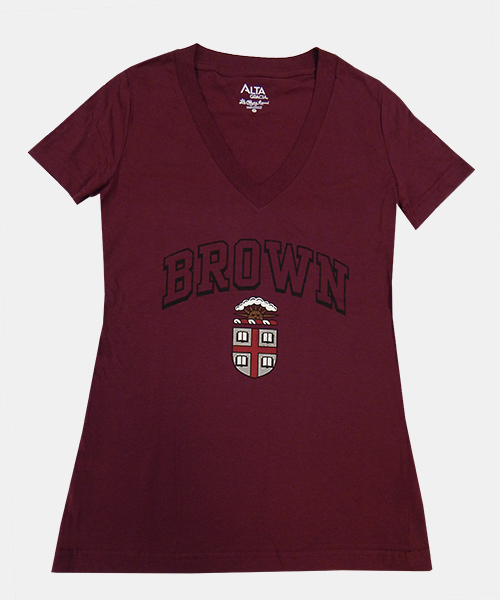 V-Neck Women's Tee - $26.99. Champion 100% cotton, white, v-neck women's tee with cap sleeves. 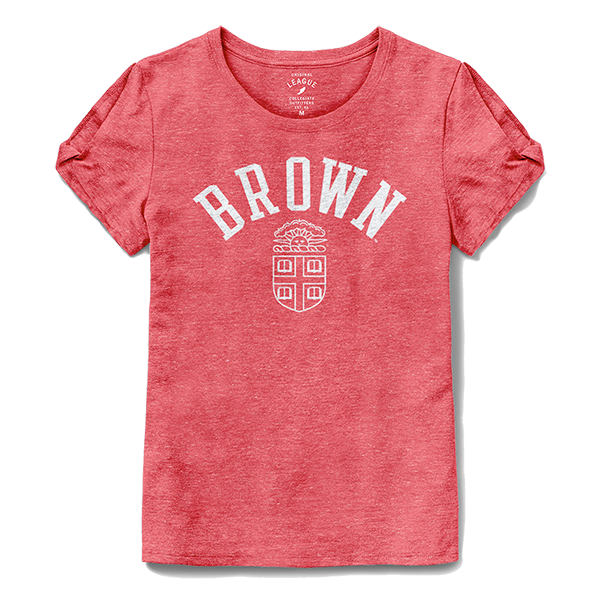 'BROWN' imprinted in dark brown with cardinal outline above 'UNIVERSITY' in black above cardinal Crest. 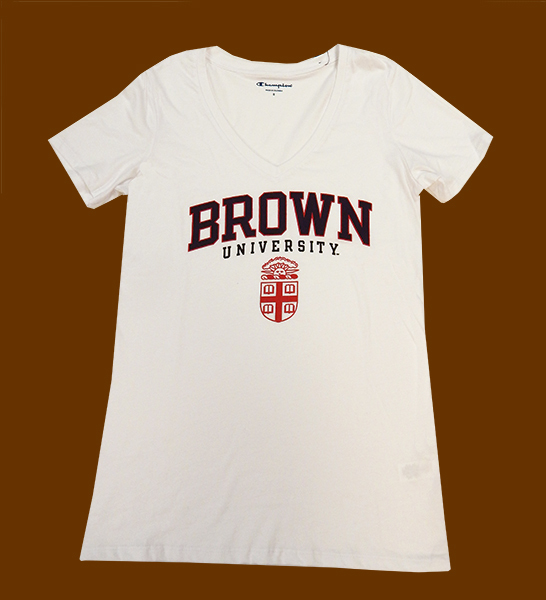 Please select option for Champion White Crest V-Neck Women's Tee - $21.99. 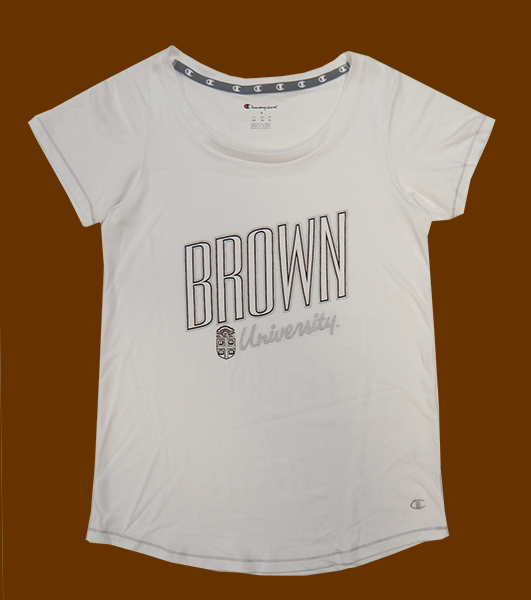 Champion 100% polyester, white, scoop-neck women's tee with silver top-stitching and cap sleeves. 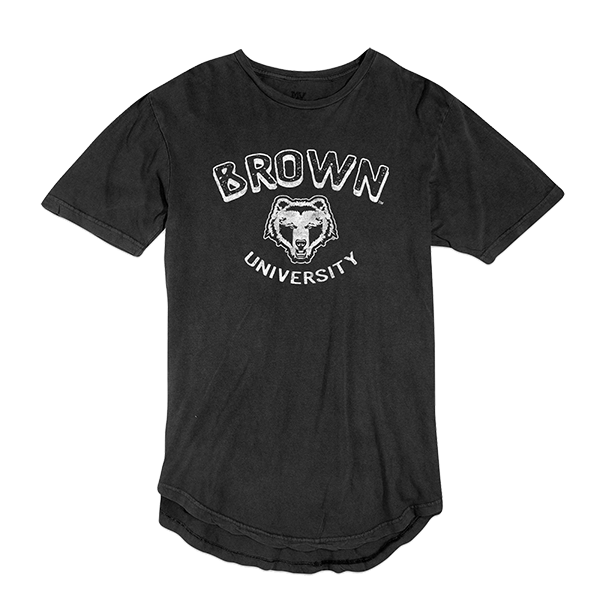 'BROWN' imprinted in dark brown and silver outlines above dark brown and silver Crest next to 'University' in silver script. Please select option for Champion White Univ. 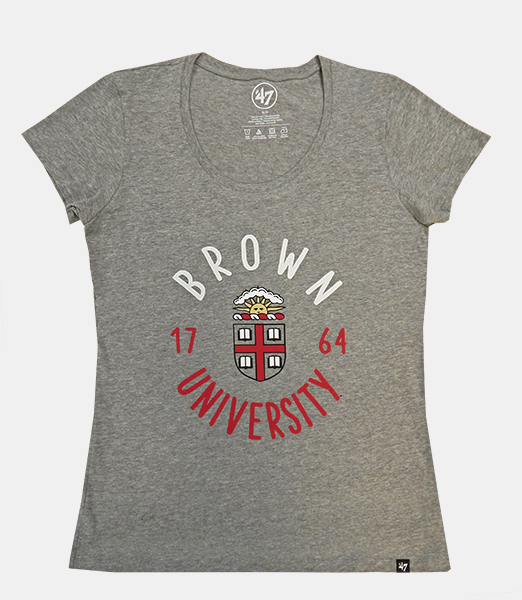 Scoop-Neck Women's Tee - $27.99. The Space Dye Performance Tee is made of 100% polyester jersey with moisture wicking and antimicrobial technology. This v-neck high performance knit tee has an all over double needle cover stitch, barracked side vents and a modern silhouette that delivers better mobility by eliminating excess bulk fabric. 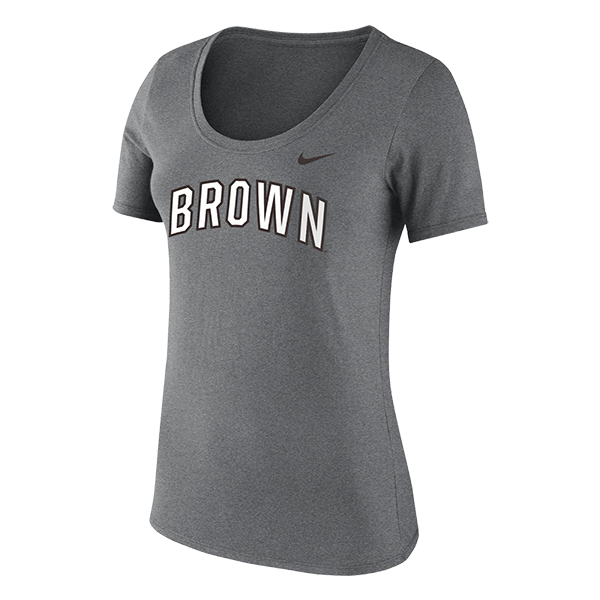 Please select option for Charles River Women's Grey V-Neck Performance Tee - $29.99. 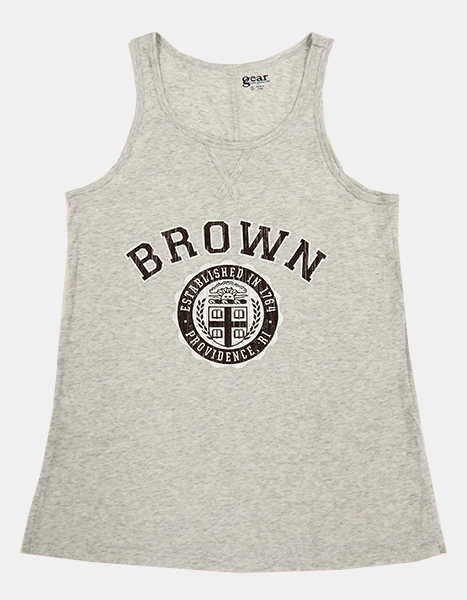 Gear 60% cotton, 40% polyester, light grey women's tanktop with 5 1/2" split side seams. Distressed imprint of 'BROWN' in brown with white outline above large brown and white medallion with 'ESTABLISHED IN 1764' and 'PROVIDENCE, RI' in white around the circle and brown and white Crest in the middle. Please select option for Gear Grey Medallion Women's Tanktop - $27.99. Please select option for League Academy Turtleneck - Oatmeal. 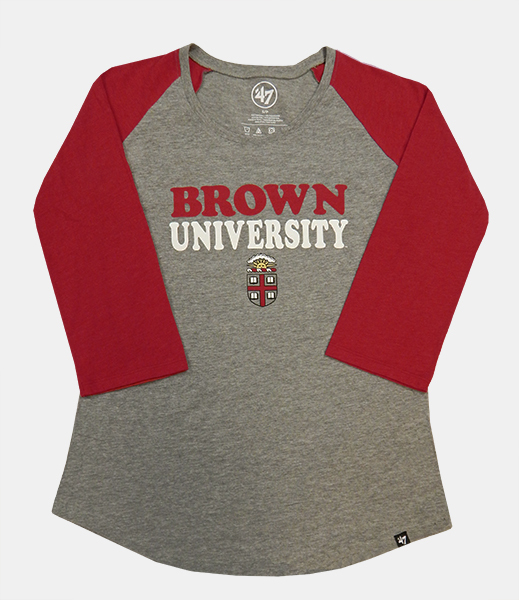 Please select option for League Intramural Baseball Tee - Red. Please select option for League Phys. Ed. Short Sleeve - Red. Please select option for League Phys. Ed. Short Sleeve Tee - Dark Blue. Please select option for MV Vintage Scoop Bottom Women's Tee - Black or Red. 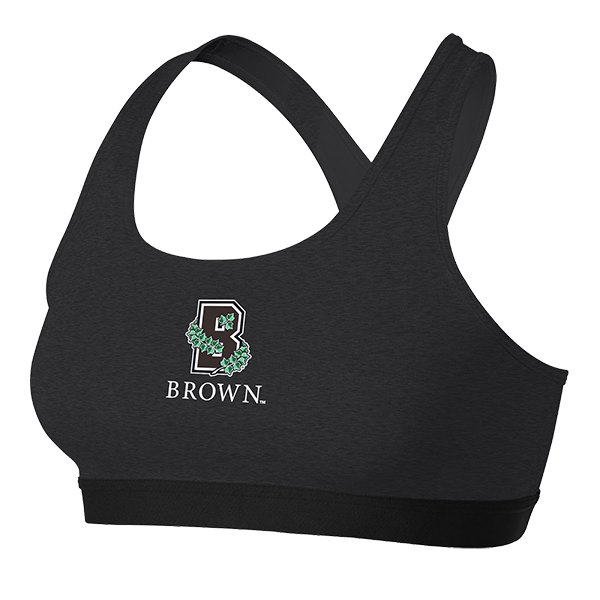 Please select option for Nike Pro Classic Sports Bra - Black, Sport Gray, or White. 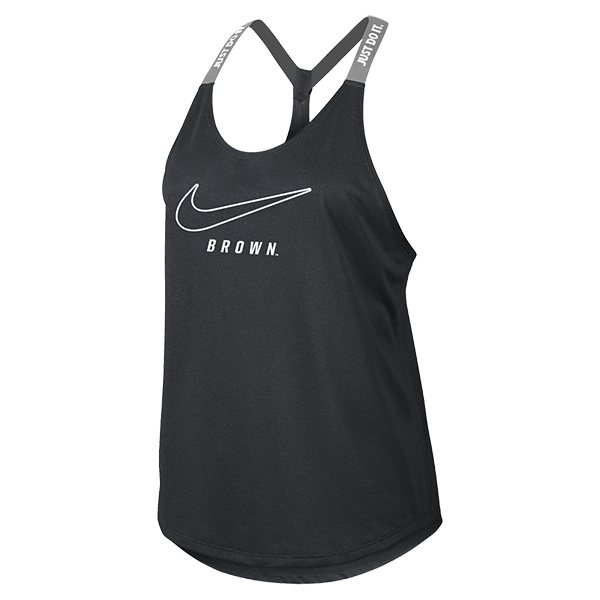 Please select option for Nike Women's Dry Elasta-Tank - Anthracite or Gray. Spirit, 75% rayon, 20% polyester, 5% spandex. 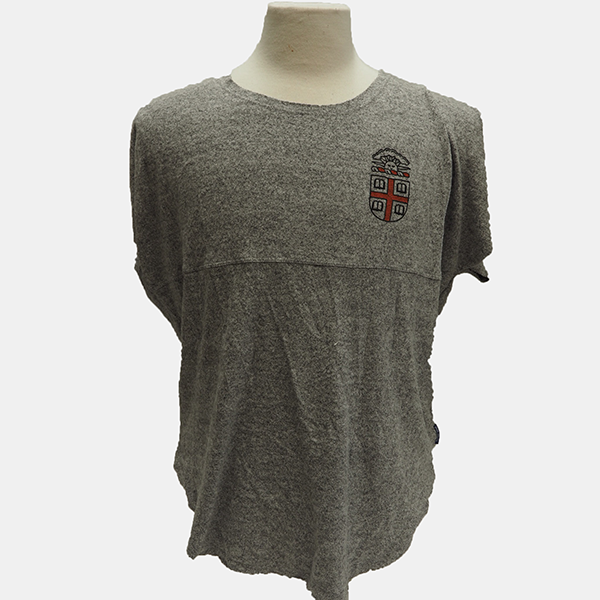 Light weight grey women's tee with loose collar. 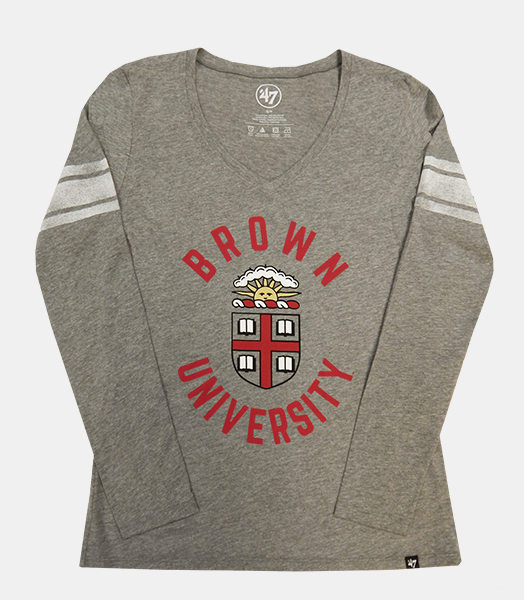 Features Crest imprinted in black and cardinal on left chest, and 'BROWN UNIVERSITY' imprinted in dark grey lettering across back. Please select option for Spirit Women's Grey Tee - $48.99. Under Armour heatgear, semi-fitted, 50% polyester, 37% cotton, 13% rayon, black v-neck women's tri-blend tee with cap sleeves. Distressed imprint of 'BROWN' in cardinal with white outline above cardinal, black, white, and gold Crest above 'UNIVERSITY' in white. Please select option for Under Armour Black Crest V-Neck Women's Tee - $34.99.